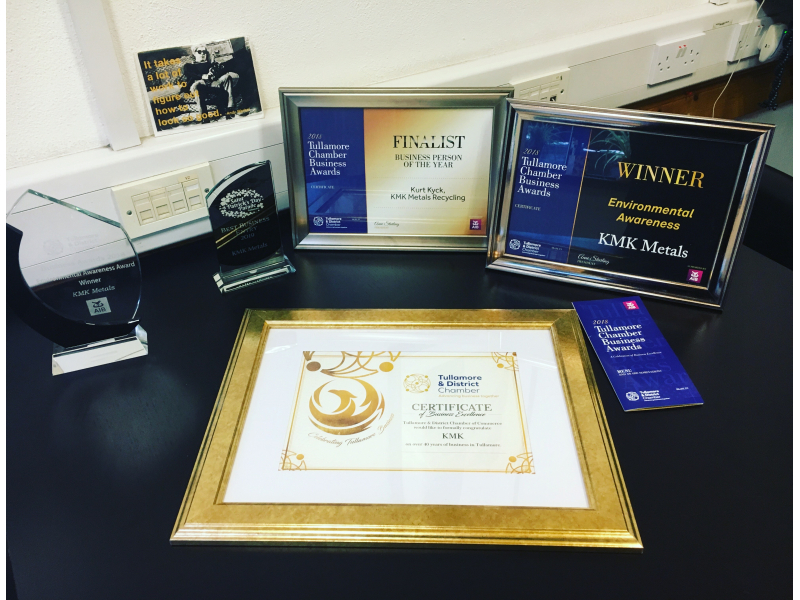 The award for ‘Environmental Awareness’ was bestowed upon KMK Metals Recycling Ltd. at the Tullamore Chamber Awards, held in the Tullamore Court Hotel on Saturday, April 6th. KMK was also honoured for reaching the milestone of 40 years in business this year. Announcing KMK as the winner of the ‘Environmental Awareness’ category, the company was praised for its efforts to consider the environment and the high environmental standards it has achieved. KMK have been certified by NSAI since 2001 and possess the Environmental ISO 14001, Quality ISO 9001 and Health & Safety OHSAS 18001 standards under a continuously audited and efficient integrated management system. Recently KMK received updated standards for ISO 9001 and ISO 14001 as revised in 2015. Also, preparations are underway to apply for the updated Health & Safety OHSAS 45001 standard. The company’s decision to engage Urban Volt to upgrade all buildings to energy-saving LEDs in 2019 was also highlighted. LEDs are up to 80% more efficient than traditional lighting, such as fluorescent and incandescent lights. A special presentation was made to a number of companies in Tullamore, including KMK Metals Recycling, who are celebrating 40 years in business.